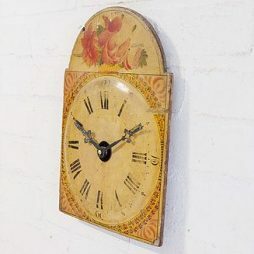 Antique Clocks | Interior Boutiques – Antiques for sale and mid century modern furniture, french furniture, antique lighting, retro furniture and danish furniture. 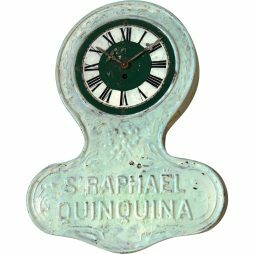 Good example of a rare French Vintage Advertising Clock for St.Raphael- the celebrated aperitif. 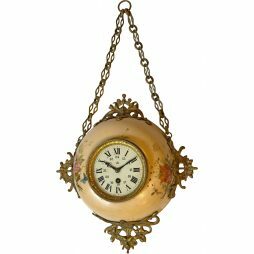 Made of pressed tinplate with embossed lettering and with its original brass pendulum movement, the clock case has been overpainted at some time in its history. Measures 20 inches high x 15 wide x 2 deep. 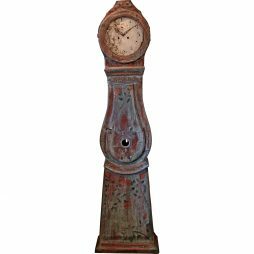 19th Century Rustic Longcase Clock from Sweden. 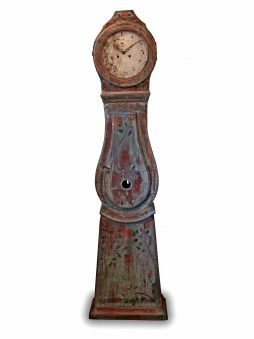 In very old or even original paint with floral motifs, dating from c. 1829 , this country piece came from an old farmhouse in southern Sweden. 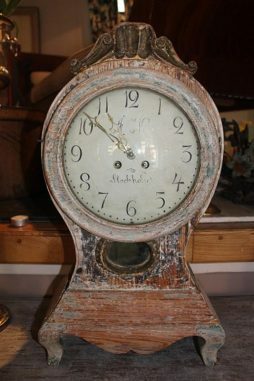 The clock comes complete with its pendulum , pair of heavy weights and original winding key. In original condition with natural wear from age. Stands 78 inches tall x 20 wide at the base. 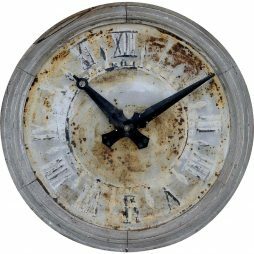 Interesting old Tower Clock Face from a Church Steeple in Normandy in northern France, with years of weathering. 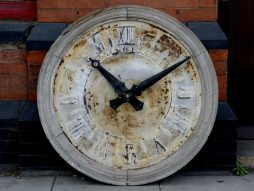 The painted metal Clock Face has been converted to an electric movement at some recent time, but still retains the original metal hands. The wooden surround is also original. 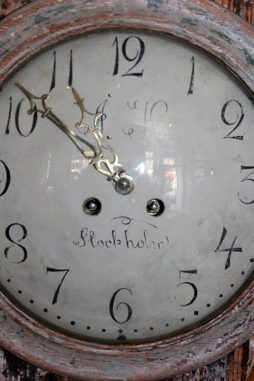 The movement is probably not working but the clock can now easily be fitted with a modern electric movement so that it would work. 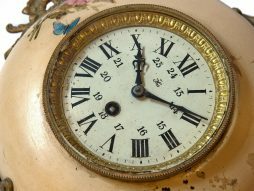 A very large pair of gilded metal Clock Hands from a 19th century Church Tower Clock in France. 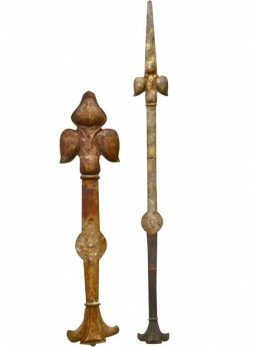 The hammered metalwork has a convex shape at the front and the original gilding is worn. 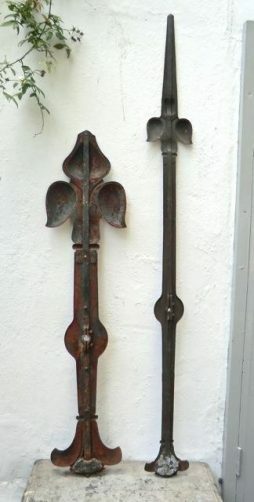 Both hands are supported by iron rods on the reverse sides. The hands measure 62 inches and 48 inches long respectively. 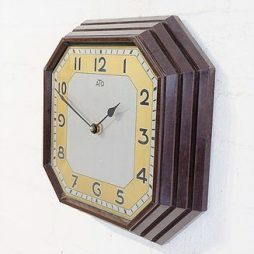 Made originally with an electric motor made by the firm ATO, this French octagonal wall clock is now fitted with modern quartz. 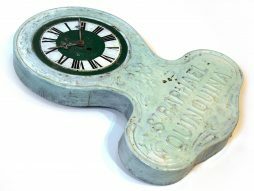 The case is Bakelite and the dial is pure Art Deco in style. 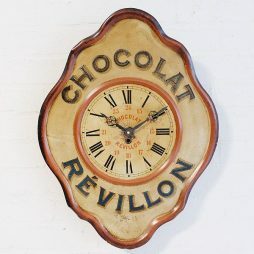 An iconic advertising clock promoting hot chocolate by the firm Revillon. 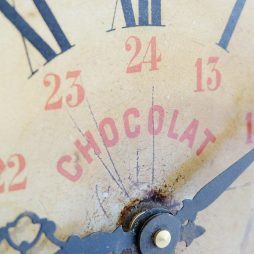 This drink was as popular as coffee is today in the bars and bistros of France in the 1930's. They were given to the bar owners to promote their brand. We have adapted the distinctive hands to fit a modern quartz movement because the old mechanical movements they used to have are now defunct. 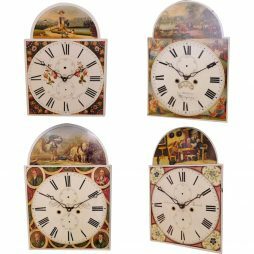 A perfect Christmas present for a clock at a great price. Made in the 1930's with a mechanical movement, now replaced with a modern quartz. 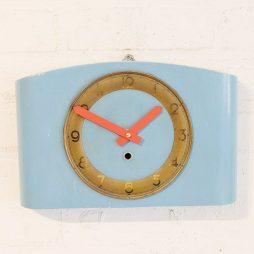 The clock has a new lease of life with it's bold red hands and cheerful blue wooden casing. 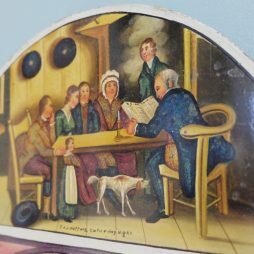 This is an example of a hand-painted clock from the Black Forest circa 1890. 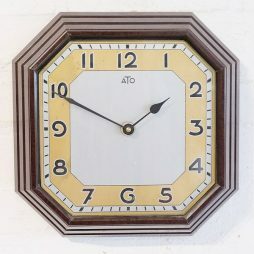 Now fitted with a quartz movement and would fit easily in to a traditional country decor. 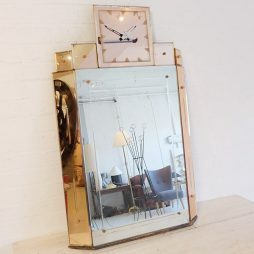 A fabulous example of an English Art Deco mirror clock, the sort of piece you would have seen in the cocktail bar of a posh west end hotel. 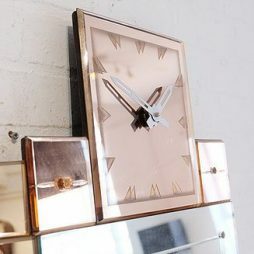 The peach glass surround highlights the oblong mirror and the clock is mounted centrally on the top. 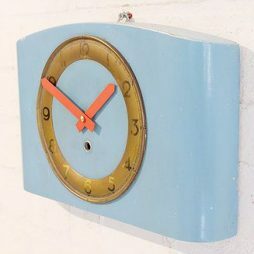 Originally the clock would have been mains powered but we have adapted the original art deco chrome hands to fit a modern quartz movement so it is fully functional. 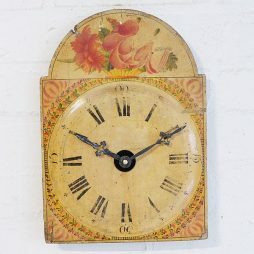 We have never had another clock like it before so in the right seting this will make a real centre piece.